Screen Gems has posted a teaser website for writer/director Kurt Wimmer's Ultraviolet, starring Milla Jovovich and coming to theaters on February 24. The site gives you a first look at the poster artwork. Set in the late 21st century, a subculture of humans have emerged who have been modified genetically by a vampire-like disease (Hemophagia), giving them enhanced speed, incredible stamina and acute intelligence, and as they are set apart from "normal" and "healthy" humans, the world is pushed to the brink of worldwide civil war (a war between humans and hemophages) aimed at the destruction of the "diseased" population. 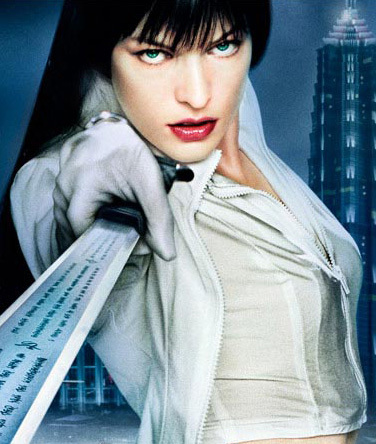 In the middle of this crossed-fire is - an infected woman - Ultraviolet (Jovovich), who finds herself protecting a nine-year-old boy who has been marked for death by the human government as he is believed to be a threat to humans.